These are tough days. From reports of international terrorism, to the local corruption that plagues every aspect of our government. We blame the government, we blame each other, and at times we blame (or question) God. How could He allow such atrocities and injustices to happen? And we ask ourselves: Shouldn’t we unite, arise and fight? Yesterday’s devotional reading of Jeremiah Chapter 29 gave me an important insight. Jeremiah was a prophet at the time of the Babylonian exile of the Israelites. He is the modern-day equivalent of priests or pastors. There are times when our situation will be less than ideal, and God may have brought us to a place of discomfort or we may be away from our friends and relatives or the government may be bad or oppressive. But He says that He know the plans He has for us. And that these are plans for our good and not for disaster (29:11). No matter how bad looking it might seem at the outset, no matter how long the trouble, God wants us to trust that He knows what He is doing, and what He is doing is and will always be for our own good. We need to pray and seek Him out continually (29:12) because if we do, with all our hearts, humbly and without presuppositions and presumptions, He will hear us and we will find that He has been behind every nook and turn all along (29:13). The sufferings will pass. The troubles will be replaced with peace. He will bring joy and comfort to us. And what is our role? Our role is to be still before Him and pray. In Jeremiah Chapter 29, Jeremiah wrote the exiles in Babylon, urging them not to defer their lives. He asked them to make the most out of their time in Babylon. God’s instruction for everyone was to build homes, plan to stay. There were no instructions about fighting the government, about packing their bags and making an escape back to their hometown. No! They were asked to stay, marry, have children, find spouses for their children, multiply. They were not urged to take arms against the city they were exiled into. They were not asked to form militant groups and rally in front of the king. And mindful of the history of the Babylonian empire, it wasn’t easy for them to do this. This was a foreign land. The Temple which was very dear to them as nowhere. They have a pagan king. The food was different, the culture miles apart from the kind they grew up with. It was hard adaptation. But God asked them to stay and make the most out of their time for the next 70 years. That’s an entire lifetime. And not just that. He asked them to “work for the peace and prosperity of the city where they were sent into exile. (29:7 NLT)” God asked them to “Seek the welfare of the city…and pray on its behalf; for in its welfare (you) will have welfare. (29:8 NASB). Sometimes, we squirm at the slightest inconvenience when God brings us somewhere beyond our comfort zone. It may be a new responsibility under an unforgiving, demanding boss. It may be relationship that has gone sour and unexciting. Or it may be a love that has yet to arrive. It may be being governed by people who take your money and spend it lavishly to provide for themselves and their families comforts unimaginable even for ancient kings. It may be a place of work and being with a group of people who don’t share your views or principles and keep you in isolation. It may be being far away from family and friends, in a country with a different language and culture. It may be religious oppression and non-tolerance. In all these situations, God asks us NOT to postpone and defer our lives until the problems end. He wants us to keep plodding on through the situation we are in, making the most out of the situation, while also seeking His heart and His will in the process. He wants us to trust Him, that no matter how grim the situation or seeming prognosis, everything will be all right in the end. His plans are meant for our good. And yes, that includes the injustices and oppression around us. I feel sad when I see leaders, including church leaders urging people to fight the government, as if that was what God inspired their hearts to do. For me, it betrays a lack of understanding of Scripture, and an empty hollow faith, a lack of trust in the Sovereign power of God. Instead of rallying, demonstrating and hitting back, His Word tells us to respect the all governing authority (yes, the government and yes, our bad bosses), because all authority comes from Him and those in positions of authority have been placed there by Him. (Romans 13:1-2 NLT). He even goes to say that “anyone who rebels against authority is rebelling against what God has instituted, and they will be punished.” (13:3 NLT). This was written by St Paul, who was then, a prisoner of the Romans. He urged his people to obey the same authorities who shackled him and who were about to execute him. God wants us to pray for our situation, for the welfare of the people who lord it over us, for the unpleasant people who annoy us, for our places of work and residence. We are to pray for it/them, as their welfare will determine our welfare. At the end of the reading is a beautiful promise. “I will bring you back again,” the Lord said about His exiled people. God will restore peace, justice and prosperity again. 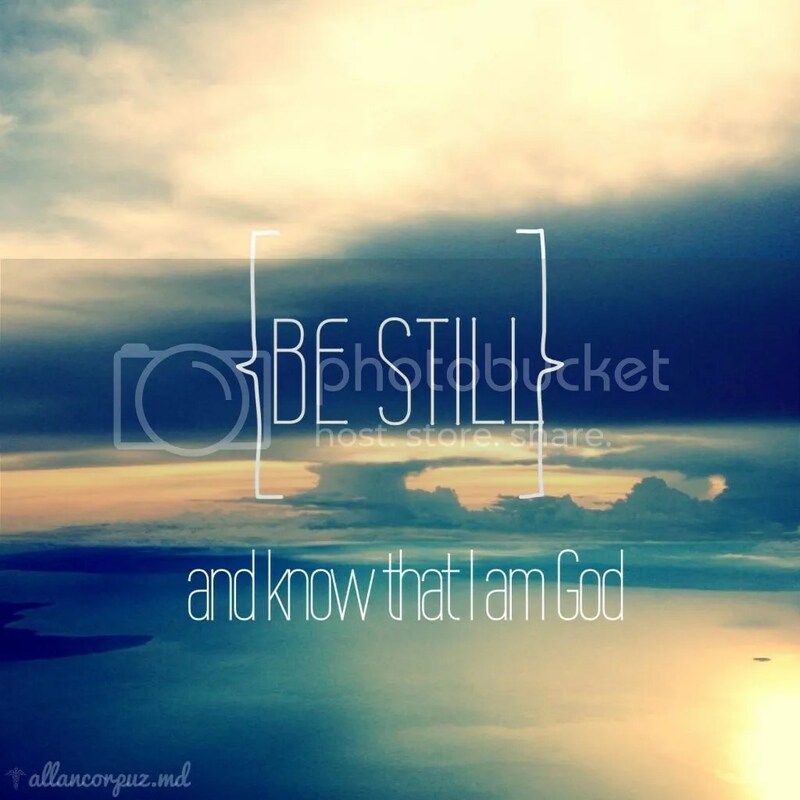 We need only to be still before Him.